When you build an E-Learning course, it’s important to integrate your training materials with a test (or multiple) in order to verify student aptitude and knowledge acquisition. 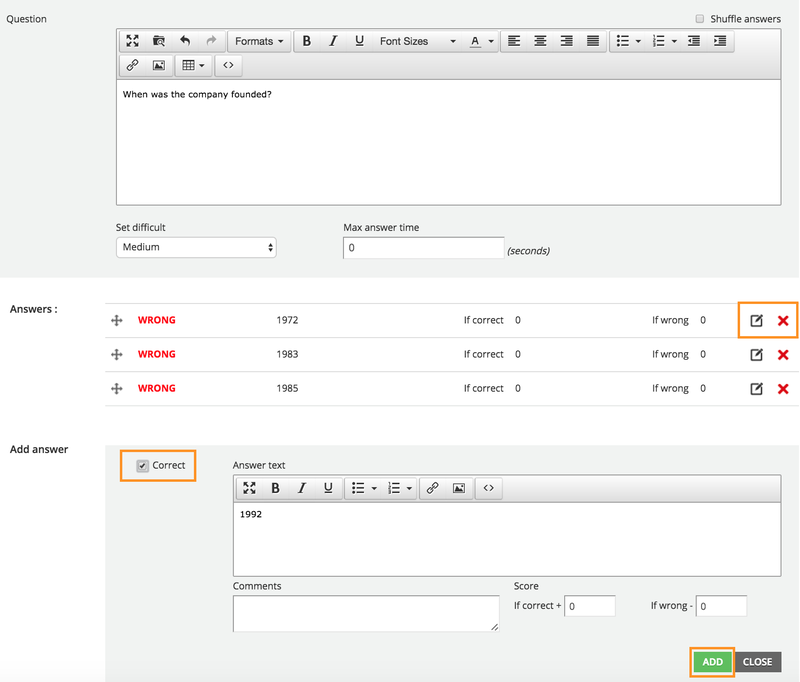 That is why Docebo allows you to to create tests quickly and easily. This brief guide will show you how to create and manage multiple tests for your E-Learning courses. Begin by selecting the Admin menu icon (gears icon) from the left sidebar, then select the Courses item in the E-Learning section. 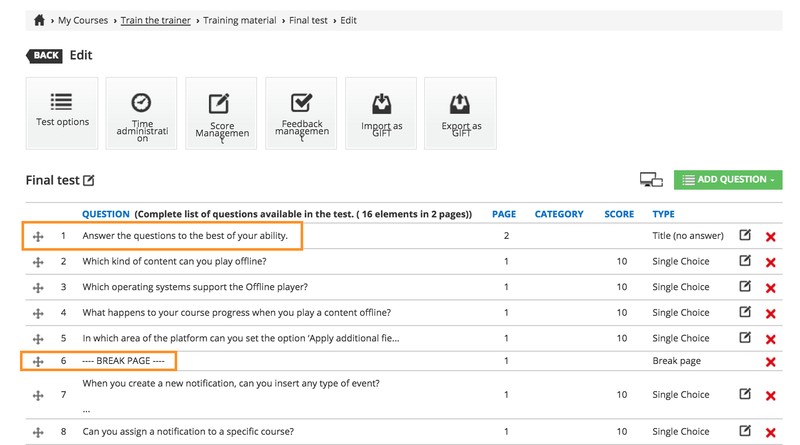 On the main Courses page, choose the course from the list in which you would like to create your test, then click the highlighted icon on the right side of the course’s row. Then, select the Training Resources option from the dropdown menu. 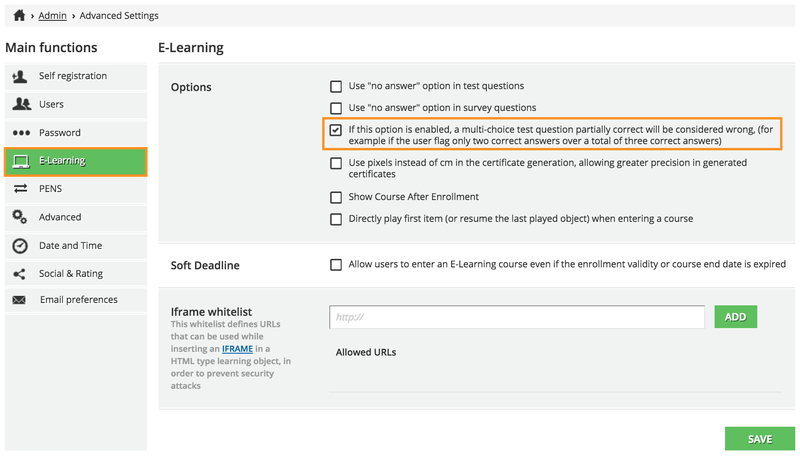 To create a new test, click the Add Training Resources button on the Training Materials page. Then, choose the Test option from the dropdown menu. On the next page, type a title and a description into the corresponding text boxes. You can also switch to the Additional Info tab on this page to add a short description of the test and choose or upload a thumbnail. Then, press Save Changes to create the test. In the action bar, you can configure the test options, manage the time, score, and feedback of the tests, or import or export the test as a GIFT file. Remember: The test must a GIFT file if you want to import it into the LMS. Directly below the action bar, you will see a button that allows you to questions. When you click the Add Question item, you then choose which kind of question you would like to insert from the dropdown menu. Once you’ve created the questions, they will appear in a list on the bottom of the page. In the question’s row in this list, you will see the question title, number of pages, category, score, and question type. You will also see the icons that allow you to edit (pen and paper icon) or delete (unlink icon) the question. 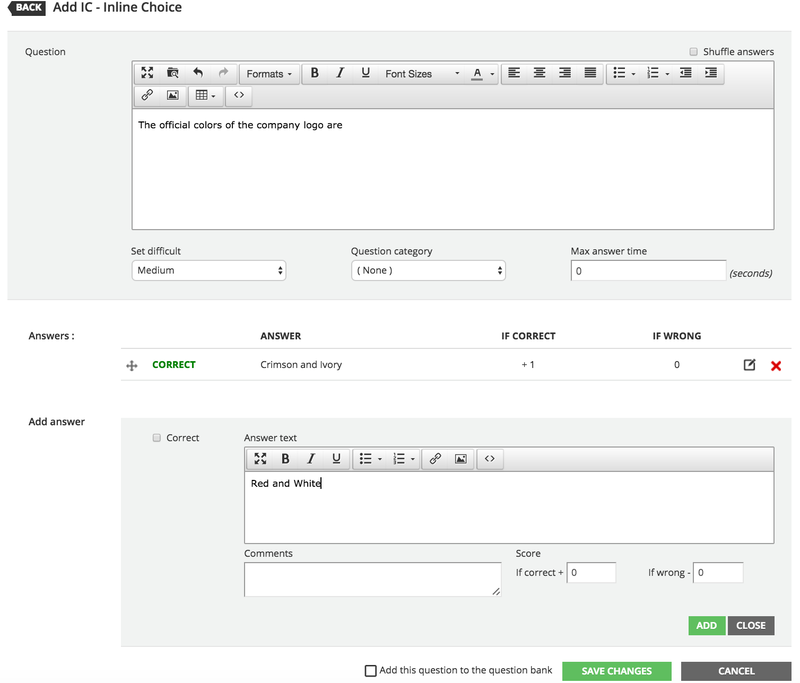 The test tool gives you the chance to add different types of questions to your test. Some question types allow you to choose a difficulty level, shuffle the answers, and add a maximum time limit for each answer. You can also manage these details using the time management section. 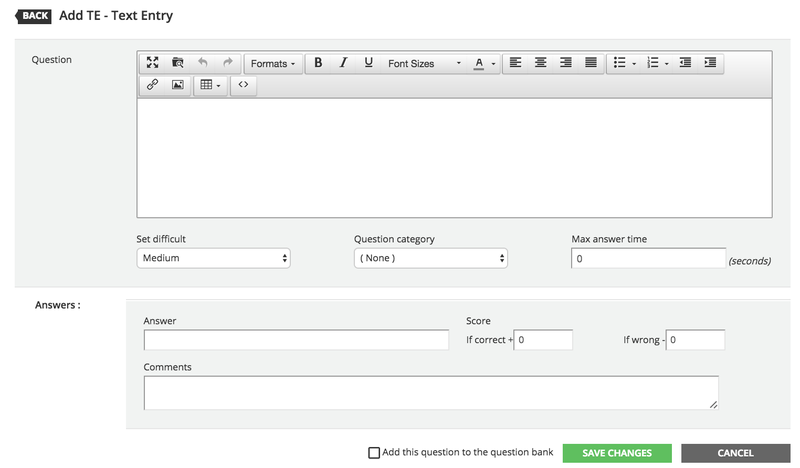 For each question, you can also assign a score to each answer, add or delete answers, or add comments/feedback. You can use to customize your test. Now, let’s view each question type. For this type of question, students can choose a single answer among those proposed because there is only one correct answer. When you create a single choice question, you will then need to mark which answer is the correct one. In the Question section, begin by adding the question into the corresponding text box. You can edit the text or add links or images as necessary. Then, move to the Answers section and press the Add Answer button. After you type the answer into the corresponding text box, press Add. You can flag the check box on the left side of the answer that you wish to identify as correct. 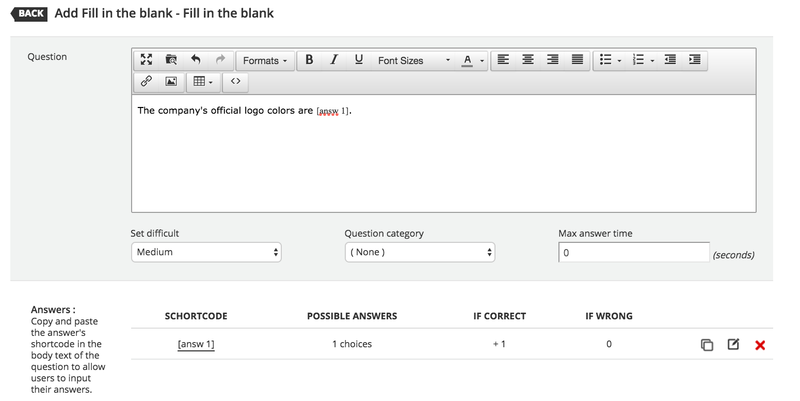 Please note that you can edit or delete an answer using the corresponding icons in an answer’s row. This kind of question is one of the most popular choices, because it allows you to give precise instructions to students and provide immediate feedback after they select an answer. When you’re finished, you can flag the option to add the question to the question bank, then press Save Changes. For this type of questions, students can choose more than one answer from a list of questions. When you create a multiple choice question it’s recommended to add more than two answers. In this way, students will understand that they have to pick more than one answer. After you type the answer into the corresponding text box, press Add. You can flag the check box on the left side of the answers that you wish to identify as correct. Equally divide the total score for the right answers. So, if the student gets one answer correct, they will still get partial credit. Mark the entire question as wrong if the student doesn’t select all of the correct answer choices. 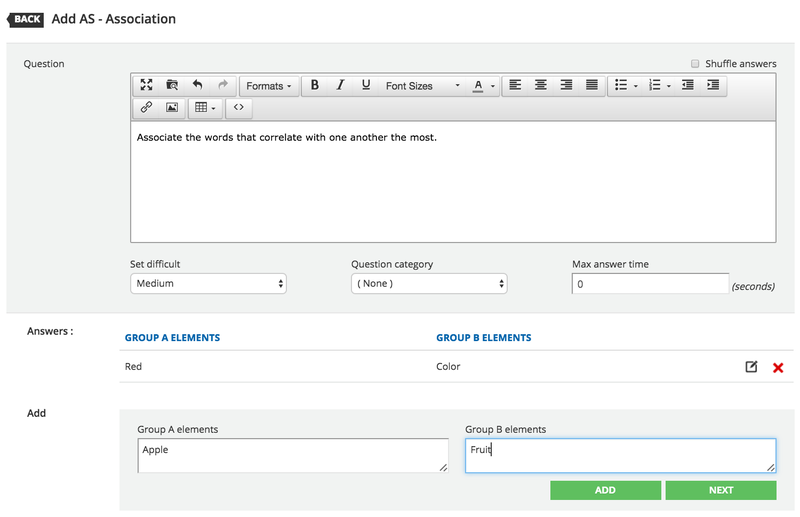 To finish setting up this type of question, you need to flag an additional setting within your LMS. To do so, access the Admin Menu, then choose the Advanced Settings option from the Settings Area. Now, when you insert a multiple choice question into a test, students must select all of the correct answers, otherwise the multiple choice question will not be considered correct. Give students a list of options with more than one correct answer. Give student a phrase to complete and ask them to choose the correct options from a list. Ask the students to select, from a list, more than one correct statement. For this type of question, students will respond with an extended text written by themselves, instead of choosing among a list of options. You can use this tool to verify your students’ in-depth knowledge and understanding of the course. Clearly, this kind of question requires more control and dedication of review from the Admin because the system is not able to calculate the score. In the Question section, write the question into the corresponding text box. You can edit the text or add links or images as necessary. When you’re finished, you can flag the option to add the question to the question bank, then press Save Changes. 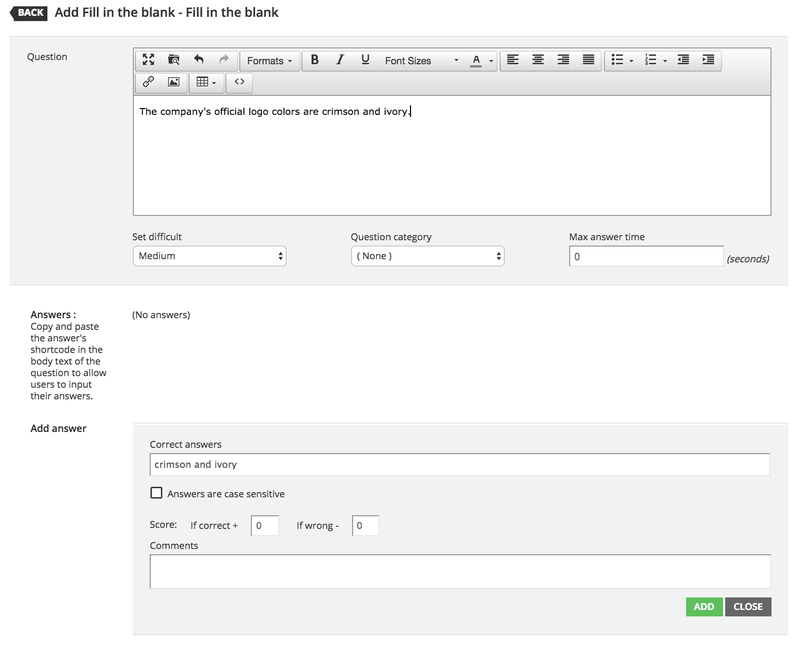 You can also add “fill in the blank” questions to tests. Begin by writing the question in the Question box. Below, you will see a plus sign button labeled Add Answer. Click this button to add the possible answers for a single blank in the question, then type the correct answers in the box labeled accordingly. After typing all of the possible correct answers for a blank, you can flag whether you want to answers to be case sensitive, then select a score for the answer and press the Addbutton. If your question has more than one blank, you’ll need to repeat the process of adding another answer, typing in all of the possible answers for that specific blank, then saving them by pressing the Add button. You’ll notice that once you have added answers, they will appear in the answers list in the middle of a page with a short code. To insert the answers into the question, highlight the answer in the question box, then click on the short code from the answers list to replace the highlighted text. 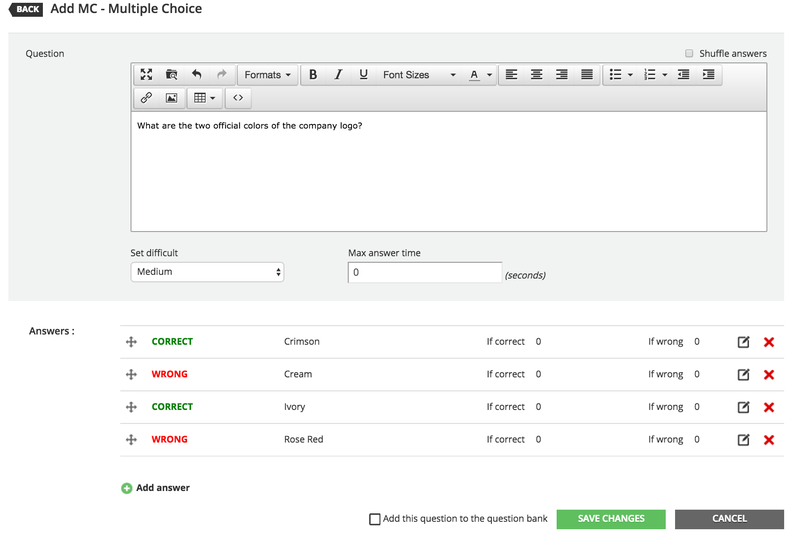 After inserting the short codes into the question, you can choose to consider the question correct only if the learner provides correct answers for all of the blanks in the question. Simply flag the box at the bottom of the page to enable this. When you’re finished, press Save Changes. For this question, students are asked to upload a file that will be downloaded and evaluated by the instructor. You can request various file formats, such as pdf, ppt, word documents, and images. You can use this type of question in several different ways to create a deeply thorough evaluation of student’s knowledge and skills. In the question text box, type in the instructions for users to upload a file. Then, press Save Changes. How Can an Instructor Evaluate Extended Text and Uploaded Files? To give a score to extended texts and uploaded file question types, the instructor must access the Statistics and Reports tool. Once you’re on the course’s Training Materials page, press the Manage Course icon from the left sidebar, then choose the Reports option. In this area, find the User Statistics tab, then click on it. Here, you will find a list of users that have submitted extended texts or files in this course. 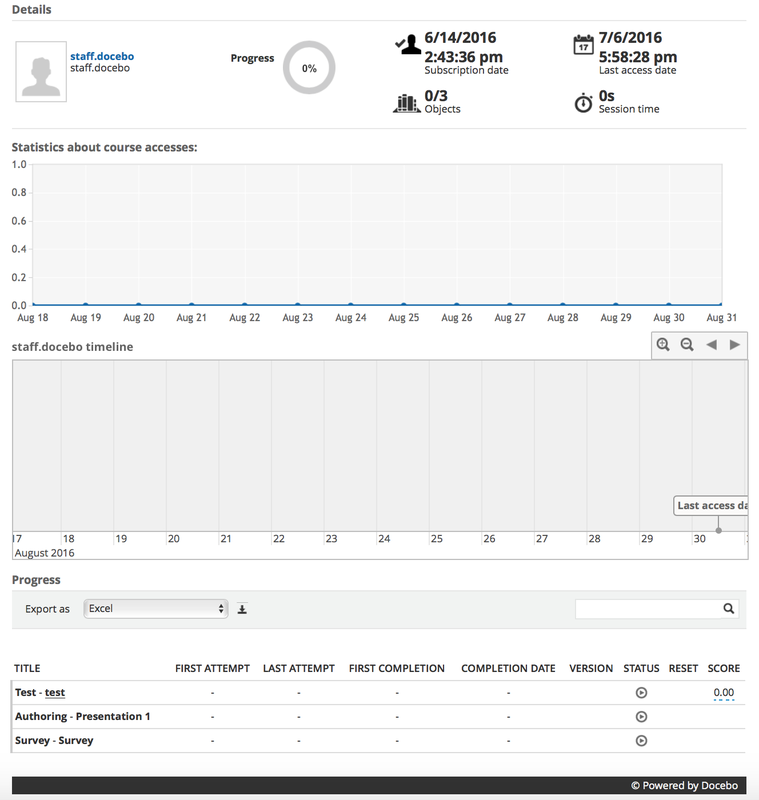 In the list, click on the username of the user, then scroll to the bottom of the user’s statistics page. Here, you will find the training materials that have been completed or uploaded by the user. Then, click on the title of the material to edit the score and provide feedback. For this type of question, students must select the correct answer from a drop down menu. Similar to the single choice question, the inline choice has only one correct option. However, this option should be composed of only a few words, instead of complex phrases. Begin by writing the question in the Question box. Below, you will see a plus sign button labeled Add Answer. Click this button to add the possible answers for the dropdown menu that will appear at the end of the question, then type the answers in the box labeled accordingly. After typing all of the possible correct answers for a blank, select a score for the answer and press the Add button. Be sure to flag one of the possible answers as Correct. Please note that the dropdown menu for this type of question will appear at the end by default. However, if you want it to appear in the middle or beginning of the question, use the [answer] shortcode when typing the question into the question text box. For this type of question, students must fill in the blank portion of a sentence with the correct missing piece. Remember: When you create this type of question, it’s important to think about very short answers (no longer than one or two words). Begin by writing the question in the Question text box. Then, below, add the correct answer in the corresponding text box. You can add a score and comments to the answer as desired. For this type of questions, students must associate answer choices with a topic. This is a very common type of question. While not as demanding, this question type requires a high level of student attention. When building this question, explain to the students what they will have to accomplish (in the question box) and fill in the answer boxes with the elements that associate with one another. In Group A, type in one word. Then in Group B, type in the associating word. Then, press Add. Repeat the process to create as many associations as desired. The last two options in the add question menu are Title and Break page. Use these to divide the test into various parts or provide explanation for the test before users begin answering the questions. When you add these elements to a test, you can use the cross section in the break page or title’s row to delegate where they belong in the test. If you add a Title, you will need to type in the instructions or introduction of the test in the text box. Then, press Save Changes.